22 Types of Smart Windows Technologies - Touch Display Research, Inc.
by Jennifer Colegrove Ph.D. Principal Analyst at Touch Display Research Inc. 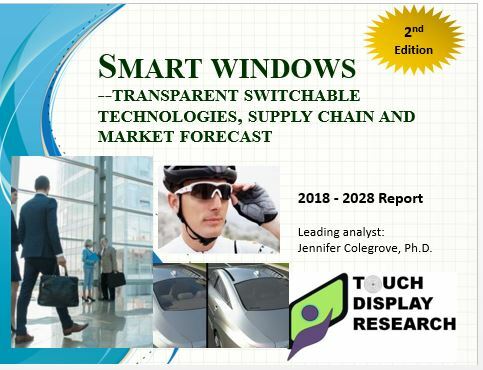 In the recently published “Smart Windows Transparent Switchable Technologies, Supply Chain and Market Forecast 2018-2028 Report,” Touch Display Research Inc., a market research and consulting firm, analyzes twenty two types of smart window technologies, which include nineteen active smart window technologies, three passive smart window technologies, and one type that can be both active and passive. More than 140 companies working on smart window technologies are profiled in the report. This is the 2nd edition with many update over the first edition (which was published in 2017). 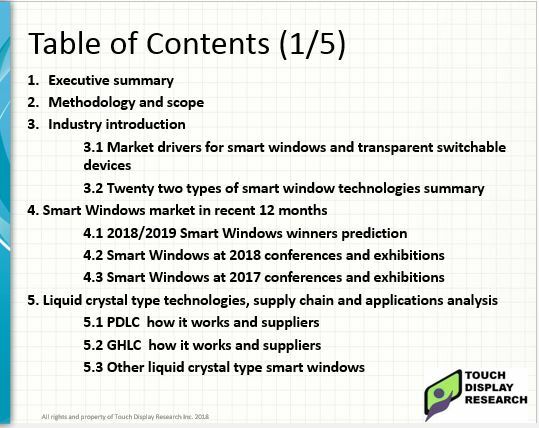 Figure 2: Smart Window 2018-2028 report Table of Contents (Full TOC and report sample is available upon request). This report profiled over 140 companies and research institutes working on smart windows, and transparent switchable devices technologies. Colegrove, author of this report, has performed many first hand surveys and interviews with many smart windows suppliers and material suppliers. Market data in the report includes 2016-2017 history data, and 11 years forecasts (from 2018 to 2028). The market forecast data includes Area (m2), smart window module ASP and Revenue, with detail breakdown by of 5 smart windows technology categories: EC, SPD, GHLC, PDLC, and other tech; and with a detail breakdown by 5 application categories: automotive, architectural, aircraft, eye wear and other applications. Challenges of smart windows industry are analyzed. Business strategy recommendations are provided in the report as well. Transparent displays, transparent lighting, transparent solar cells are also discussed in this report. Regional analysis is also provided in this report. The “Smart Window Transparent Switchable Technologies, Supply Chain and Market Forecast 2018-2028 Report” is available immediately. “I read your monthly report from cover to cover. It’s very informative and helpful.”–a client of the Touch and Emerging Display monthly report. Touch Display Research, Inc. (www.TouchDisplayResearch.com) is a technology market research and consulting firm specializing in touch screen and emerging display technologies such as OLED displays, quantum dots, flexible displays, e-paper displays, ITO-replacement, Active pen, near-eye displays, smart windows, gesture controls, voice controls, and eye controls. Touch Display Research helps technology companies grow and connecting their technologies to the marketplace. We have been writing about OLED industry for over 10 years. We were the first company to publish Quantum Dot market reports. We were the first company to publish Active Pen market report, and ITO-replacement market report. We have always been there to analyze new and emerging technologies. Touch Display Research provides reports, consulting, and due diligence to touch suppliers, display manufacturers, consumer electronics ODMs/OEMs, material suppliers, investors and venture capitalists. We are member of Flextech Alliance, SEMI and SID. This entry was posted in Smart Windows and tagged 22 types smart windows, smart windows, smart windows market, smart windows technologies, switchable, transparent on May 29, 2018 by jennycolegrove.